Ardeche and Gorges du Tarn Trip July 8th to 13th 2006 Me and Annette. Saturday 8th - Fly to Nimes. Very hot, change into my shorts for the rest of the week. A problem with the hire car, end up with the only car which they have left, a Toyota Aygo with no air-conditioning. Have a quick drive around Nimes and then up the A9 past Orange to Bollene. Drive on to Vallon Pont D'Arc. Camp at the Provencal camp site, right by the river. Walk into town in the evening and eat in the square. Sunday 9th - Rent a canoe from Acqua Bateaux. Set off from Vallon Port D'Arc at about 1am. Fantastic hot weather. Everyone seems to be in front of us as the river is very quiet. Arrive at the second Bivouac site, Gournier at about 7:30pm. A long drag to get the stuff up from the river to the camping area. Cook lots of meat and have a couple of bottles of wine. During the night we hear a wild boar sniffing round the tent. Monday 10th July - Have breakfast sitting at the front of the tent, lots of wasps. Talk with a couple of teachers who are taking a load of school kids down the river. Second day on the Ardeche. Drive over to the Tarn, go via Arles. Arrive very late at a campsite near Florac. Drive into town for a couple. Tuesday 11th - Rest Day in St Enimie, talk with a couple driving round Europe. Wednesday 12th - Canoe down from Saint Enimie to La Malene. Drive down to Millau. Spend a lot of time driving to the new bridge visitor centre, but it is shut. Drive down the D999, very long winding road. Stay in the IBIS hotel in Nimes. Go to McD's for tea. When we get back the hotel bar has shut ! Thursday 13th - Back to Derby for noon. River Orb May 1st 2005 Me and Annette. 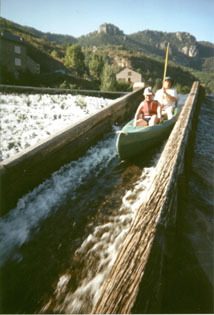 Sunday 1st - Drive to Roquebrun to canoe on the river Orb, go down the paege to Beziers and up from there. Get there for about 1.30pm. The man tells us to go the Blue Lizard to get some sandwiches. Enjoy the trip down the river, have a bite to eat by the bridge at Ceps. On the way back plan a long drive through the national park and then realise that we are short of petrol. Try a few petrol stations but they all need a Carte Bleu and none are attended. Not only is it a Sunday but also May Day. At about 9pm we decide to stop by petrol pump and wait for someone to arrive with the right cedit card. We wait about 20 minutes. Drive about � a mile and the next petrol station has a very bored looking attendant. Drive back via Mazamet. Gorges du Tarn Trip August 26th to September 2nd 2001 Me, Helen, Anna, Clive Darke. Sunday 26th - Fly to Nimes on Ryan Air. Go to the Budget desk and ask if they have a vehicle with lots of space. The woman says she has a very funny car for us, we hire a Fiat Multipla. We drive to St. Enimie, arrive at about 3pm. Locate the canoe hire place. Camp just down the river at Courdec, realise that we need a hammer and a six inch nail in order to get any pegs in. Enjoy swimming in the pool and the river. Drive back into town for a meal. Monday 27th - Hire two Canadian canoes from Canoe Canyon. We are taken upstream by mini-bus to Grand Ravin. Start canoeing at about 10.30am in fantastic hot weather. Canoe for almost a mile before we stop and have a swim. We stop in the small village of Prades at noon. We struggle up the steep valley sides in the blazing sunshine. We find a bar but unfortunately it is 'ferme'. Carry on to St Enimie. Stop for a beer and some rations. Camp at Courdec again. Walk back into town for a meal. Enjoy a 'Salade du Chevre Chaud'. Tuesday 28th - Have a French breakfast at the camp-site. Start canoeing again at about 10am. Stop just after 'La Malene' for some lunch. The water is incredibly clear and we do some snorkeling. We are transported down stream from 'Pas de Souci' past a section of 'Danger du Mort' water. Finish the day with a toboggan run down a weir. Camp near the river again in Les Vignes. I like the view across the river to the village. Walk over the bridge and eat in a restaurant hanging over the river. Introduce Clive to Salade Gourmand and Steak Roquefort. Wednesday 29th - Carry on to Le Rozier down an almost deserted river. There are lots more rapids that on the previous two days. Arrive for about 2pm and swim in the river while waiting to be picked up. Transported back to St. Enimie, have a beer and then back to Les Vignes for another night. Thursday 30th - Lay the map out on the ground and decide to head south to Perpigion. Try to find a camping place at Argeles and then Collioure. End up in Banyuls. The camp site is rock hard. Go out for a meal next to the beach. They all speak English, I am almost disappointed. Friday 31st - Have a day on the beach outside a hospital. Swim in the sea, see large shoals of fish. Drive up an incredibly narrow track to the Tour Madeloc. Stay another night in Banyuls. Drive to Collier for a meal. Have a very good pizza in a square near the sea. A band is playing on the shore, stay and listen till late. 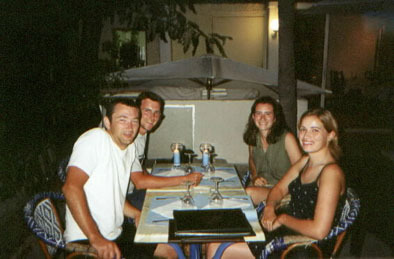 Saturday 1st - Drive back to Nimes, arrive at about noon. Try to stay in a formula 1 but find an IBIS instead. Go round 'Les Arenas' very impressive. On the way back beat a BMW M3 away from the lights and he is not amused. Sunday 2nd - Fly back to be greeted by rain at Stanstead. 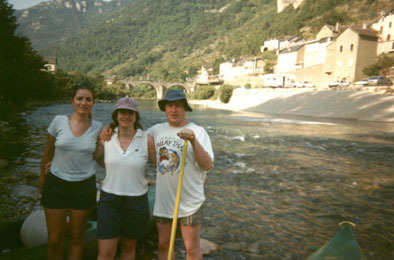 Ardeche Canoe Trip August 6th to 13th 2000 Me, Helen, Anna, William Bugg. Sunday 6th - Fly to St. Etienne on Ryan Air. Hire a green Renault Megane. Drive down to Vallon Pont d'arc, via Valance. There are so many golden M's on the way that we have to stop at one of them. Go to the canoe hire shop to check a few details. Drive down the very narrow back streets trying to find the Hotel Belvedere, which Tim had booked for us. Monday 7th - Buy some food at the super market, meat for the BBQ, jam, bread, vin and water. 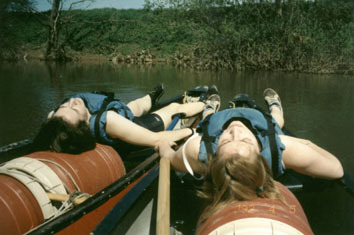 Hire two Canadian canoes from Adventure Canoes. Depart at 1pm. The predicted two and a half hours ( 7 km ) takes till 7pm due to lots of rests and swimming. Some very exiting rapids. Stop at bivouac Gaud. Me and William make a very good fire, bbq the meat and drink the vin, a good evening, talk about the old times. I sleep out. Tuesday 8th - Brioche and strawberry jam for breakfast, leave Gaud at noon, a fair distance to go by 4pm. Coach back to Vallon. Back to the Belvedere, have a meal there, we all share one room. Wednesday 9th - Drive along the top of the Gorges. Stop off for breakfast, hot chocolate and cookies. Visit the grotto Medaline, very good. Down to Avignon, look at the bridge, walls. Nip across to Nimes for a look at the Colosseum. 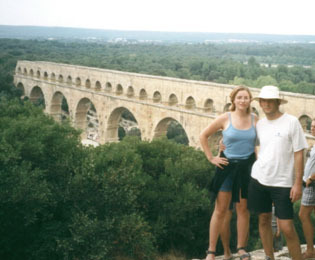 Call in for a quick look at the Pont Du Gard, very impressive. Head south using the AutoRoute to Marseilles, do a few circuits and then on to Cassis. All camping spots are 'complete' so push on to La Ciotat, there are 9 campsites there but we can find no space. Try many hotels and just when we are about to give up and head into the hills, William finds a hotel room for two people at 'Le King', which we all share. It has a wonderful view of the bay, sit on the balcony and drink vino tinto. Thursday 10th - Find a campsite first thing in the morning. Go into La Ciotat for a large pizza for breakfast sitting on the sea front. Drive back to the alcove that we considered camping in late last night, now rather busy. Spend the day there. Lots of people are jumping in from cliffs, William has a go. Drive out to Bandol for a meal. Eat in "La Cigale Bleue", excellent food, fireworks in the background. Friday 11th - Me and William queue for ever for some sandwiches. Go on a boat trip from Cassis. Go to a very nice cove. Saturday 12th - Head north today. Hit a few queues on the AutoRoute. Drive over the 'Pass de la Revolution' and then past the airport. Try a few hotels, follow signs into a ghost town. Take directions to the hotel Iris. I knock on the door to be told that it has shut for years, 'Scooby Doo where are you ! '. Find a hotel near to the (or maybe a ) Loire river. We wander round to try and find a bar but end up back in the hotel. Sunday 13th - Fly back to Stanstead. Willo Tinto catches a train back to London. I am disappointed by the amount of things that don't work at Stanstead airport. Drive back and get a McDonald's happy meal, complete with Little Miss Naughty and her demonic laugh, it haunts my car for the next month. Friday 28th - Leave at about 5pm. Drive down to Helen's, call in for McDonalds. Takes about two hours to get to Hay-on-Wye. I have some problems finding the bridge over the river. We go to the Three Tuns. The pub with the oldest continuous serving bar-maid. Lucy has been serving there from when she was 15, now she is 83. We pay £3.80 for 4 pints of very dodgy beer. She asks us if we have the time so she knows when to close. Saturday 29th - Good breakfast in Hay. 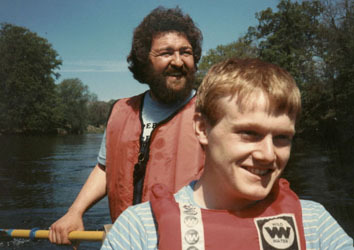 Hire two Canadian canoes from Jim at Paddles and Pedals. Set off at noon. After a lot of chat about me being the 'Master Paddler' Helen and I go straight into Hay bridge pillar and nearly tip over in direct view of Jim. The weather is a little cloudy in the morning and clears in the afternoon. Stop at the 'Boat Inn' just after Witney bridge and have a nice curry for lunch. The pub is just next to the river. Arrive at Bredwardine just after 6pm. The 'Old Court' is an amazing place. We have a four poster bed and a huge bedroom. Set off for a little walk round Bredwardine, we end up on an hour and a half ramble. Walk up to the 'Red Lion' for evening meal. PK buys a bottle of wine and we drink it in our private lounge. Sunday 30th - Have a good breakfast. Take pictures of the huge chimney, it is just an open hole to the sky. Set off at 10.30am. I paddle in shorts. At about lunch time we see a pub high above the river. Pull the canoes over to the side of the river. Struggle up to the Ancient Camp Inn. They serve no food. After a pint we canoe on to Hereford for chips. They are so greasy that I vow never to have fish and chips again. Canoe on. Me and Helen get more adventurous, we go down the rapids with PK and Anna. We arrive at Sink Green farm at about 6.30pm. They give us a lift up to the farm in the landrover. Anna has a little sunstroke, the rest of us are a bit sunburnt. We get a Taxi into Hereford at about 8pm. Have a couple of drinks and then go to Deep Pan Pizza. Monday 1st - Paddle in shorts again. The girls paddle hard again. We go to the 'New Harp' in Hoarwithey for lunch. It turns cold in the afternoon. We finish at the Hope and Anchor in 'Ross-on-Wye' at 5pm. Jim gives us a lift back to Hay. Drop Helen off and then home for midnight. 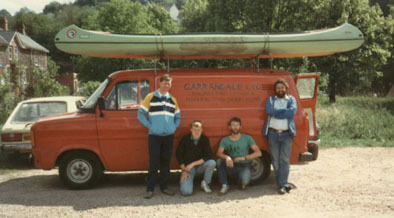 May 9th 1987, 24 hour, 100 mile canoe Wye. Me, Darren Pickard, Ron Shaw and Mike Sheehan. Saturday 9th - Set off at 12 noon. River pretty low. Do a lot of walking to Glasbury. Just on schedule. Paddle hard and just keep on time. Me and Darren do a lot of getting out and running across the loops and along the side. At Bredwardine for 6pm, see Robert and Heather, Jack and family. A little behind at Hereford, have fish and chips under the bridge and put on the night gear. Pass Mordiford at 12.15am. Sunday 10th - Capsize at 2.30am due to Mike mopping out water. A bit behind at Ross, have breakfast and leave at 6.15am. Monmouth at 10am. Do the next 7 miles in one hour. Darren's Mum, Dad and Gran come along to wave us on. Finish at Bigsweir bridge at 11.40. Six blisters on my left hand, difficult to walk. Very pleased to have just broken the 24 hour barrier for 100 miles down the Wye. We believe that nobody else has acheived this feat. Go to the tea shop and then on to 'The Boat Inn' for some pedigree. 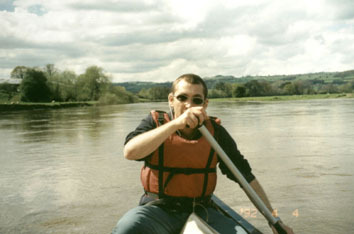 River Orb June 7th 1998 Me. 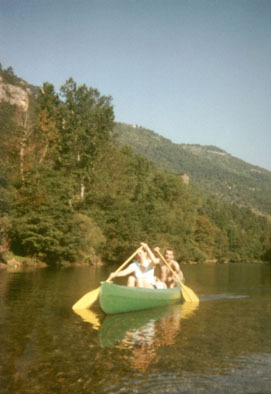 My first taste of canoeing in France. 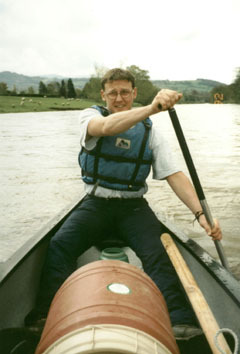 September 19th 1986, Attempt on 24 hours down the Wye.